We are launching our first national campaign Feed People First. 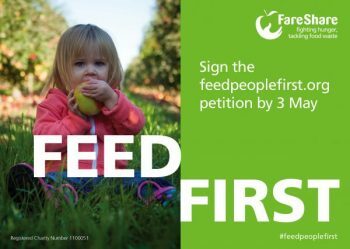 The campaign calls on our stakeholders and the public to sign a petition that could help deliver more good surplus food to charities across the country. The petition needs to receive 10,000 signatures by 3 May to get a response from Parliament. With 100,000 signatures the petition must be debated in Parliament. We are asking the Government to offset the costs of charitable food redistribution which could include re-packing, harvesting, transporting, storage and handling, so that 100,000 tonnes of good food could be used for people in need. By doing this, the UK charities you work with could save an estimated cumulative £150 million, savings which they could reinvest into their services and feed even more people in need.